A bomb has targeted the convoy route of Pakistan's former military ruler, Pervez Musharraf, within minutes of him passing, police say. They said it was an attempt to target the former president, however, no casualties were reported. The blast struck a bridge on Mr Musharraf's route from a hospital in Rawalpindi, where he was being treated. He was admitted to hospital for chest pain in January on his way to court at the start of his trial for treason. Earlier this week, the former army chief was charged with five counts of treason over alleged constitutional violations during his time in power. Mr Musharraf, 70, has denied the charges and says all the accusations against him are politically motivated. The blast reportedly struck Faizabad Bridge late on Wednesday night, as Mr Musharraf was being transported from a military hospital to his farm house on the outskirts of Islamabad. It is not clear whether the bomb exploded before or after Mr Musharraf's convoy passed, however, one police official quoted by the AFP news agency said the bomb exploded before he crossed the bridge. "Four kilograms of explosive device planted in a pipeline under a bridge exploded around 20 minutes before the former president was supposed to cross the spot," senior police official Liaqat Niazi said. Mr Musharraf was taken home via an alternative route, he added. His spokeswoman, Aasia Ishaq, confirmed that he had reached his home safely, according to Associated Press. There has been no claim of responsibility for the attack, which police say they are investigating. His most serious challenge is a treason case, which bears five charges including suspending the constitution and imposing emergency rule. He has pleaded not guilty but could face death if convicted. Mr Musharraf has survived numerous assassination attempts and plots against him during his time in power. Since returning from self-imposed exile last year, the Taliban has vowed to kill him, with security threats preventing him from attending a number of his trial hearings. He stands accused of unlawfully suspending the constitution and instituting emergency rule in 2007. On Wednesday, the Interior Ministry turned down Mr Musharraf's request to end a travel ban preventing him from leaving the country to visit his sick mother in Dubai. He is currently under house arrest and has been placed on an exit control list restricting certain Pakistani nationals from leaving the country. His lawyers say they plan to submit another appeal to the courts asking for his name to be removed from the list. President from 2001 to 2008, Mr Musharraf was one of Pakistan's longest-serving rulers. 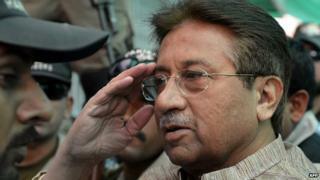 Will Pakistan's Pervez Musharraf be convicted of treason?